Voltage sensing relay to turn equipment on or off based on voltage. Warning - connect to a warning light or sound buzzer to turn on at set voltage. Auto switch battery banks - connect to our solenoids and auto switch battery banks at a set voltage. The relay is 10A but you can connect it to one of our larger 200A relays to control larger loads. 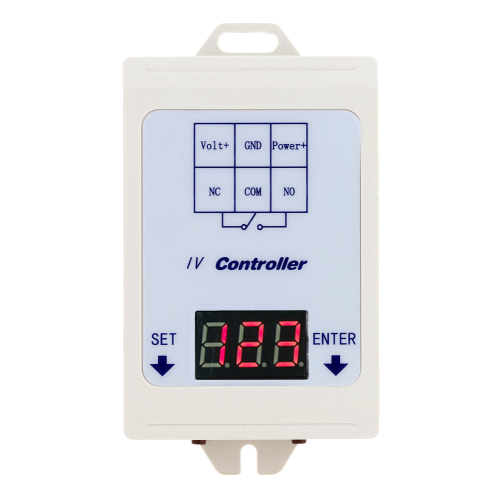 This controller, with LED digital display, adopts high-quality components and fully automatic SMT process for good performance. It has 1 voltage detection channel and a set of relay switch output(normally open and normally closed). LED digital display, mounting boss on the case, convenient and simple for user's needs. Procedures for intelligent control, realise over-voltage/under-voltage function. Adjustable input voltage detection sensitivity: 0.1-0.9s. The relay output timing range is 0-999s. To ensure stability, use industrial grade PCB board. P-4: Over-voltage/under-voltage Control(voltage limit alarm).